SCIFIT SXT7000 Total Body Elliptical is another whole body cross trainer of SCIFIT Fitness and has features like Orthopedic Bio-Flex footbeds which which improve circulation and eliminate hot spots and numbness. This elliptical has smooth pedal movement simulates uneven surface to recruit stabilizing muscles. SCIFIT SXT7000 Total Body Elliptical helps in weight-bearing total body workout with an optimized torso rotation and core muscle recruitment. It provides a bi-directional exercise. Administrative mode: includes 6 user de” ned languages, metric or US units of measure and other custom settings. Power Burst – 8 second burst of Iso-Strength. Available on all programs except: Heart- Fit Test/Training, Power-Fit Test/Training, Heart Rate, Iso-Strength and Stress Test. Programs: One button Quick Start, Manual, Hill Pro” les, Random Pro” les, Heart Rate, Iso-Strength, Constant Work, Heart-Fit Test, Heart-Fit Training (4 levels with 3 programs at each level), Power-Fit Test, Power-Fit Training (4 levels with 3 programs at each level), Stress Test and Fit-Quik™. Download results to USB ! ash drive. Simply plug your USB key in the Fit-Key slot and your work-out will be copied in a text ” le for saving and printing. 7” LCD display with user friendly interface using tactile keypad, color coded with audible beep. 1 Year warranty on footbeds and Bio-Flex pads. ToughTrain 3.5 out of 5 Have many attractive features which make it worthy at this price. Can be a good deal. *Note: Most of the sites, stores or shopping portals listed above sell SCIFIT SXT7000 Total Body Elliptical with discounts and other exciting offers. 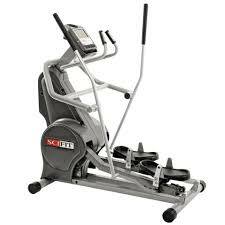 There is a possibility that the some of above websites are not selling SCIFIT SXT7000 Total Body Elliptical now. Toughtrain.com is not liable for such cases or instances. Also we do not recommend any seller for SCIFIT SXT7000 Total Body Elliptical and a buyer should buy from where he/she gets best deal with quality of products, service and on time delivery (shipment).